Jen27 - Elizabeth, WV Great wheels "I bought a set of these wheels last year & love them. So I decided to buy another set." Skid - arizona Great rim "Fit perfect fast shipping!!!" ATV wheels give your 4-wheeler the fortitude to tackle the biggest jumps and roughest terrain. Whether you race or just love riding hard in the woods the last thing you want is to be sidelined by a cracked or broken wheel. ATV wheels give style, strength, surety of mind and are some of the easiest aftermarket parts you can put on your ride. 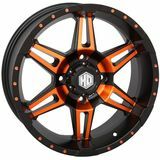 We have tough-as-nails carbon fiber ATV wheels from Hiper that lighten up your backend to boost holeshot performance, a beefed up wheel like the DWT Ultimate Conventional Beadlock that incorporates a hollow rolled lip construction to reinforce the vulnerable bead area - an ideal choice for rocky trails and rough terrain, and the styling configurations of the ITP SS112 will make your quad the envy of everyone on the track or trails. Of course, you can't go wrong with MotoSport's very own alloys. If you need help deciding on the right ATV wheels for your ride please give us a call on our toll free line 866-677-7338 or chat with an expert. 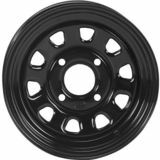 MotoSport features one of the largest selections of ATV wheels on the web. We have a 90-day return policy. We also offer fast, free shipping on orders Over $79.